Hours after San Francisco Bay Area radio show host JR Valrey screened his documentary film about police brutality at a university in Philadelphia, daily newspapers in that city carried articles about two separate lawsuits filed against Philly police alleging brutality. Those lawsuits, filed respectively by a state legislator and a high-profile media commentator – both of whom are Black – didn’t surprise Valrey. His travels across America screening his film highlighted for him – again – a reality that governmental officials constantly reject: Police brutality is a widespread scourge. “Police brutality is definitely not ‘isolated incidents,’ as officials always say after each new killing or beating by police,” said Valrey, host of the Block Report, a program aired on KPFA-FM, the Pacifica station in the Bay Area. Valrey’s film “Operation Small Axe” primarily examines the Jan. 1, 2009, fatal shooting of unarmed Oscar Grant by a transit policeman at a Bay Area Rapid Transit (BART) station in Oakland. That killing sparked riots in Oakland. That deadly New Year’s Day incident, which was captured on cell phone videos by eyewitnesses, triggered condemnations across America. In an unusual twist for police abuse incidents, a jury last summer convicted Johannes Mehserle, the BART police officer who shot the handcuffed Grant in the back, of involuntary manslaughter. Police officers involved in abuse incidents rarely face criminal charges, and most escape even discipline from their police department. Decades of incidents across the country and repeated documentation from a variety of sources substantiates Valrey’s assessment of the systemic nature of police brutality. Thirty-two years before that Philadelphia state legislator filed his federal civil rights violation lawsuit alleging two policemen roughed him up when he inquired about their mistreatment of an elderly man, a Pennsylvania House panel conducted an investigation into widespread often deadly brutality by Philadelphia police dating from the 1960s. During those August 1978 investigative hearings, a respected Black pastor called police “raving maniacs” when telling that legislative panel about his beating by Philly police when he asked them to stop beating a teen on his doorstep. Data in the 2010 semi-annual report released by the National Police Misconduct Statistics and Reporting Project listed 2,541 cases of various kinds of police misconduct nationwide between January and June of this year. Abuse from “Physical Force” constituted the largest category of those misconduct reports. Further, according to the NPMSRP’s report, police misconduct caused 124 deaths in the first six months of 2010, with 60 percent of those fatalities resulting from police gunfire. The “Operation Small Axe” film also features a segment about the prosecution of Valrey, who, during an unruly protest days after the Grant shooting, was arrested by Oakland police and charged with felony arson. Valrey says his arrest was a blatant attempt to punish him for his coverage and his criticisms of police brutality, racism and other contentious issues in Oakland. Valrey, who faced three to five years in prison if convicted, spent two days in jail after his arrest and then 14 months on bail before prosecutors dropped the arson charge on the first day of his trial citing lack of evidence. Oakland police had arrested Valrey minutes after he verbally confronted Oakland Mayor Ron Dellums, a former U.S. congressman known as a progressive Democrat. Valrey had blasted Dellums for doing too little about the Grant shooting specifically and about police abuse generally. “After criticizing Dellums, I was standing across from City Hall reviewing the video in my camera when I saw police running towards me so I ran, and they tackled me, took me to jail and took my camera,” Valrey said. “Police made up the charges at the police station. They said I started a fire in a trash can outside of the federal building. Why would I start a fire outside one of the most secure buildings in Oakland, where everything is videoed?” Valrey said. Valrey says police refused his requests to return his camera and even ignored a court order he obtained. “I never got it back,” he says. While many Bay Area journalists criticized the arrest of Valrey, some defended it. The headline for a cover story in the East Bay Express called Valrey an “Agent Provocateur” – a term generally associated with police informants assigned to cause violence. That article referred to Valrey as an “advocacy journalist” who did things “no mainstream journalist would do,” like speaking at an anti-police brutality rally. “They tried to get the community to turn against me, but I have strong support in the community,” said Valrey, who serves as associate editor at the San Francisco Bay View, a Black-owned newspaper published online and in print. Police abuse incidents have cost Oakland millions of dollars in lawsuit settlements in the past decade alone. Settlements include the $1.25 million paid in 2006 to settle 59 lawsuits arising from police beating anti-war protestors three years earlier and the $10.9 million paid in 2003 to settle a class action lawsuit against four officers who beat and/or falsely arrested 119 people. A $3.5 million 2006 settlement symbolized what Valrey and others contend is the Oakland police practice of shooting first and asking questions later. That settlement involved Oakland paying the family of an undercover policeman who was fatally shot in January 2001 by two fellow (white) officers who claimed they mistook the (non-white) undercover officer for an armed assailant. The slain officer was arresting a theft suspect. Police officials described that incident as a tragic accident, dismissing racial profiling allegations by critics. 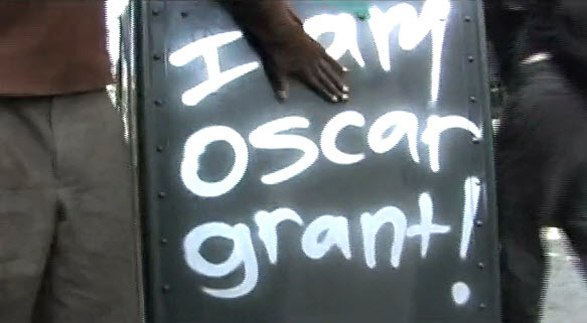 Earlier this year BART officials agreed to pay $1.5 million to the 5-year-old daughter of Oscar Grant. That NPMSRP data listed $148.5-million paid by governments across America for police “misconduct-related” settlements and judgments during the first six months of 2010. “Operation Small Axe” provides a unique focus on the ire raging within Oakland’s communities of color arising from decades of rampant police abuse. The film depicts street level anger among everyone from teens to the elderly – an anger triggered by daily indignities from police like profanity-filled commands and unnecessary force that are ignored by the news media. Another segment of the film examines the controversial March 2009 incident involving parole violator Lovelle Mixon, the Oakland man killed by police after he fatally shot four police officers. Valrey drew criticism for failing to harshly criticize Mixon for killing police. Valrey sees police brutality as a “unifier” for Black and Brown communities across the country. The “Small Axe” film began as a documentary on Valrey’s Block Report program but evolved into an examination of police brutality in the wake of the Oscar Grant shooting. Valrey says making the film was “eye-opening … like Ida B. Wells reporting on lynchings in the late 1800s.” The title for the movie comes from a song by reggae music legend Bob Marley. This story first appeared on This Can’t Be Happening, the website featuring the work of a news collective comprising Linn Washington and three other renowned journalists. They can be reached at thiscantbehappeningmail@yahoo.com. A night with the iconic artist Emory Douglas and the screening of “Operation Small Axe” set the tone for National Anti-Police Brutality Day commemorated recently at the Twin Space Continuum, 17th and Mission in San Francisco. 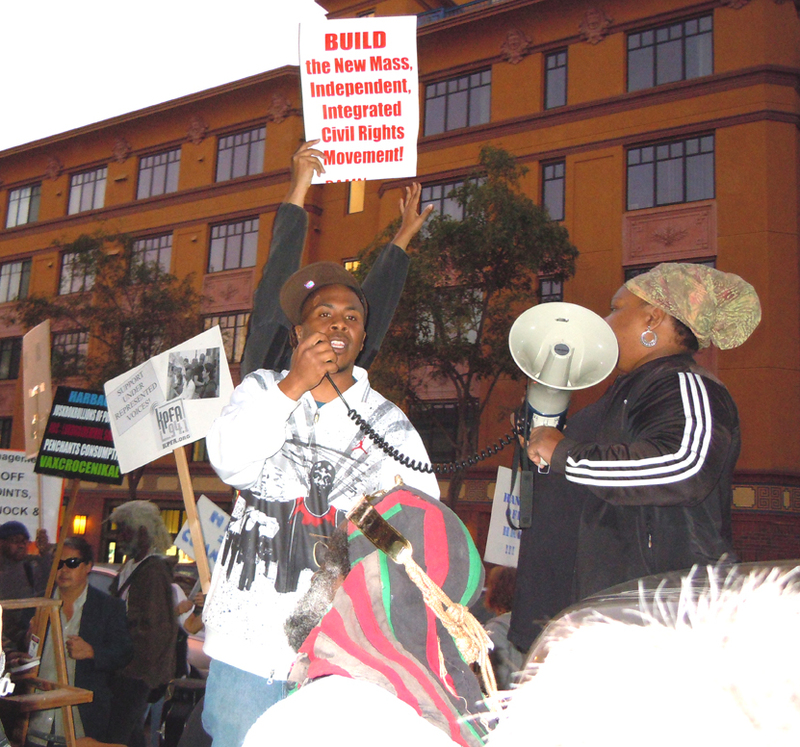 “Operation Small Axe” highlights the antipathy that Oakland residents have towards the Oakland Police Department and goes as far as describing the city of Oakland as a “war torn prison state” because “the police have been so vicious and so brutal to our Black brothers in this society,” stated the documentary’s producer, Adimu Madyun. The film presents a series of revelations including the position of neutrality Black Oakland Mayor Ron Dellums and city officials have taken since the police murder of Oscar Grant, the mainstream media downplaying the significance of the possible martyr Lovelle Mixon, who killed four police officers a few months after Grant’s death and the slaying of DeAndre Brunston. “Small Axe” also covers the fight waged by the journalist known as Minister of Information JR to win dismissal of charges that claim he set fire to a trash can during the first Oakland rebellion a week after the murder of Oscar Grant, while in actuality he was reporting on the event. The fact that former Black Panther Minister of Culture Emory Douglas and the grandson of the legendary Malcolm X, Malcolm Shabazz, made presentations added to the importance of holding the police accountable for brutality, particularly against African American men. If one ever doubted that the cops have disdain for Black youth, all confusion was cleared up when the documentary shifted to the scene of the tragic murder of Deandre Brunston, 24, that was caught on tape. Brunston’s standoff with the police, on Aug. 24, 2003, lasted about 20 minutes before they released a dog to attack him. When Brunston threw a shoe at the dog, the police began shooting. He was shot 22 times and a few bullets hit the police dog as well. The inhumanity of the police force allowed for the police dog to be airlifted in an emergency helicopter while Brunston was left to die. You can see in the video that Brunston was still moving after the police shot him. His aunt, Keisha Brunston, was never released from the back of the cop car to calm him down or persuade him to surrender. She has been involved in the movement for justice for Oscar Grant case and supported his family through the trial. The night ended with revolutionary artist Emory Douglas providing commentary and insight into his prolific drawings during his time with the Black Panther newspaper. He also spoke about artivism, defining a political agenda by means of art. He put emphasis on the fact that Black Panthers were all over the world in places such as Israel, Australia and New Zealand. He explained why he depicted the police as pigs and corrected the myth that the Black Panthers were against all white people by explaining that their focus was the racist police system. “We shall survive without a doubt,” “Freedom on my mind” and “All power to the people” were just a few slogans that were emblazoned on Douglas’ colorful pieces depicting the struggle that Black people were going through in everyday life. Instead of going a route that some commercial artists go by advertising cigarettes or alcohol, Douglas chose a righteous path of arming people in low-income neighborhoods with knowledge as he depicted the Panthers providing kids with clothing and free vegetables. Children are represented often in Douglas’ artwork. Crystal Carter, a Bay Area writer who earned her degree in journalism at San Francisco State University, can be reached at ccarter6@gmail.com. Yyou should have seen this website's comment section when the story about Oscar Grant killing first aired. what is been carried out into their set-in-stone, alter-under-penalty-of-death amusing bibles.